The #ExxonKnew campaign is about shutting down debate and clearing the way for fringe activists’ preferred climate policies, according to a new podcast produced and promoted by the flailing campaign. The podcast, entitled Drilled, is the latest content in Richard Wiles’ web of climate groups rehashing the same story that’s been debunked again, and again, and again: that Exxon Mobil somehow hid information about climate change in order to continue profiting from petroleum. Westervelt’s admissions comes at a time when climate litigation is being thrown out by federal courts, partially because it is being driven more by politics than any sound legal theory. Westervelt’s comments could be used in the court room to get other lawsuits tossed, by suggesting the cases were brought in bad faith. Westervelt should know all about propaganda campaigns, given that she’s in the middle of one. Drilled itself is more comedy than serious, investigative reporting, relying on sinister music and a one-sided cast of experts to repeat the same baseless accusations about the energy industry. At no point in her “reporting” does Westervelt note an attempt to reach out to any of the companies that are the subjects of her reporting. 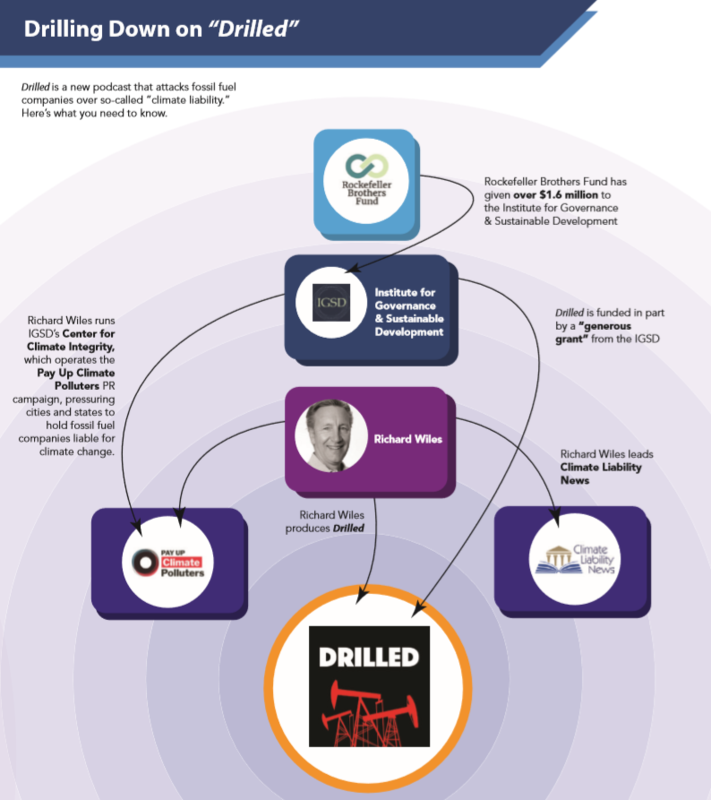 In a rare move for climate activists, however, Westervelt does disclose funding for Drilled—it’s supported, in part, by the Institute for Governance and Sustainable Development. She also discloses that the executive producer is Richard Wiles, the publisher of Climate Liability News (CLN), an activist website designed to promote climate litigation. However, Westervelt never mentions that she writes for Climate Liability News nor does she disclose Richard Wiles’ and the IGSD’s relationship to the Center for Climate Integrity, which supports litigation against the energy industry through the Pay Up Climate Polluters PR campaign. To recap, Dr. Hayhoe made an incendiary and highly charged accusation – that energy companies worked with Russian hackers – and provided literally no evidence for the claim. Franta’s criticism hinges not on whether these researchers are doing bad or illegitimate work, but that they’re able to do more work because they received grants from companies. Franta’s work, meanwhile, is supported by IGSD, a relationship he doesn’t disclose, which makes his research vulnerable to the same criticism he levies against other researchers. The same goes for Geoffrey Supran, whom Franta describes elsewhere as “a good friend of mine.” Supran, the co-author of an op-ed with Franta, also appears in Drilled to discuss his research. Supran’s research (which was strongly criticized by an expert in the field) was funded by the anti-ExxonMobil Rockefeller Family Fund—a fact that also wasn’t disclosed in the podcast. “New conservative think tanks, many of them funded by fossil fuel interests, including Exxon, Koch Industries and Peabody Coal, emerged in the early 1980s and they behaved very differently than the mainstream think tanks, most of which were started by progressives in the early twentieth century. Elsewhere, Westervelt and her guests were more straightforward with their bias. In the podcast’s second episode, #ExxonKnew activist Kert Davies reads from a survey that suggests “older, less educated males from larger households who are not typically active information seekers and are not likely to be ‘green’ consumers” are more receptive to messages that, as Davies puts it, reposition global warming as theory instead of fact. Of course, that line was actually describing an audience receptive to “the statement that some members of the media scare the public about global warming to increase their audience and their influence.” But we digress. The timing of Drilled further suggests that this content is driven by its close ties to the PR campaign supporting the climate lawsuits. The podcast launched on November 14, 2018, the same day law firm Sher Edling filed suit in San Francisco on behalf of the Pacific Coast Federation of Fishermen’s Associations (PCFFA). The eight-episode series ends with an in-depth discussion (released on November 18) on how litigation against the energy industry is necessary and righteous for ensuring that climate activists are successful. The final episode features an interview with Noah Oppenheim, the PCFFA’s executive director who has his own ties to climate activist litigation. It would surprise few if Sher Edling is working hand-in-hand with Wiles’ PR campaign and not disclosing it. Sher Edling has contracted with Resource Media, a non-profit PR firm funded by the Rockefellers, to promote its climate lawsuits. Wiles’ Pay Up Climate Polluters is getting media assistance from M+R, the same PR firm that was hired to promote Boulder’s climate lawsuit. But take it from the host herself: climate activists aren’t using the court system for justice. They’re abusing it so they can shut down debate and enact their preferred policies. This podcast, like so much else with the climate litigation campaign, is simply another component in a broader PR stunt.